Reuse businesses, charities and organisations sustained more than 800 jobs, 350 job scheme training positions & 7,600 voluntary positions with a turnover of more than €80 million in 2017. 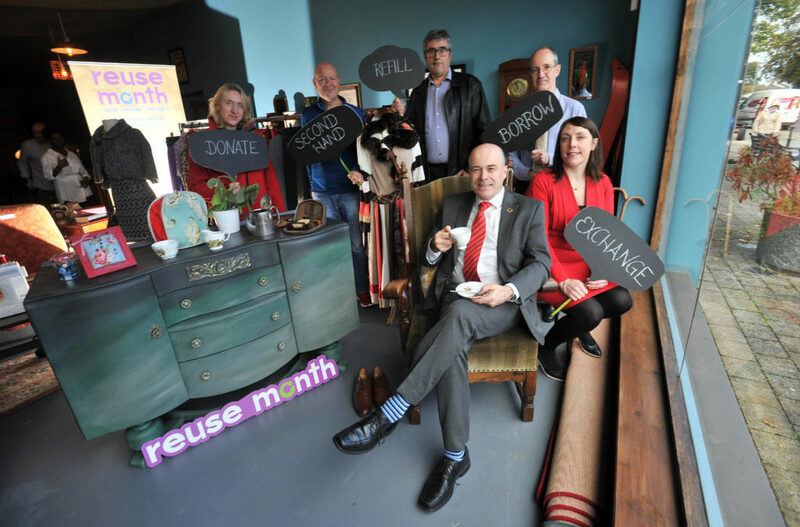 The Community Reuse Network Ireland (CRNI) is directing Reuse Month events, seminars and information points throughout every region and county, which will provide people with the skills, tools and know how to reuse more. At the launch of Reuse Month 2018 in Roscommon, Denis Naughten TD, Minister for Communications, Climate Action and Environment with Michelle Fallon, Owner, Michelle Made This. These habits all avoid the need to manufacture and distribute new products and cuts down on waste, thereby reducing greenhouse gas emissions. National Reuse Month is about growing these habit of buying second hand and upcycled, prioritising repair, borrowing, swapping and refilling. We all do it to some degree, by doing a little bit more we are benefiting our whole community and environment,” he added. Speaking on behalf of Ireland’s three regional waste management offices Sinéad Ní Mhainnín Waste Prevention Officer with the Connacht Ulster Regional Waste Management Office said, “Reuse is about valuing what we have, by using and reusing it for as long and as often as possible. It is also about considering alternative options to buying new items we might only use once. It opens up the possibility of borrowing, repurposing or purchasing good quality reused goods. As part of Reuse Month, blogger and journalist Rosemary MacCabe takes on the challenge to reuse as much as possible throughout the day. Reuse has obvious benefits to the environment, but there are also huge knock on effects for our personal finances and the general economy,” she added. Its member reused an estimated 20,400 tonnes of goods last year and recycled over 57,000 tonnes. Their efforts sustained more than 800 jobs, 350 job scheme training positions and 7,600 voluntary positions resulting in a turnover of more than €80 million. At the launch of Reuse Month 2018 in Roscommon, Denis Naughten TD, Minister for Communications, Climate Action and Environment pictured with, Sharon Cameron, Environmental Awareness Officer, Mayo County Council, Dara Wyer, Environmental Awareness Officer, Kildare County Council, Mark Malloy, Assistant Environmental Awareness Officer, Galway County Council, Greg Duggan, Senior Engineer, Environment & Water Services, Westmeath County Council and Arlene Finn, Acting Environmental Awareness Officer, Galway City Council.